The defense had lost the previous two scrimmages. Tom Herman: "They have taken a few of these on the chin in a few of these scrimmages so it was nice to send them into the offseason with some confidence." 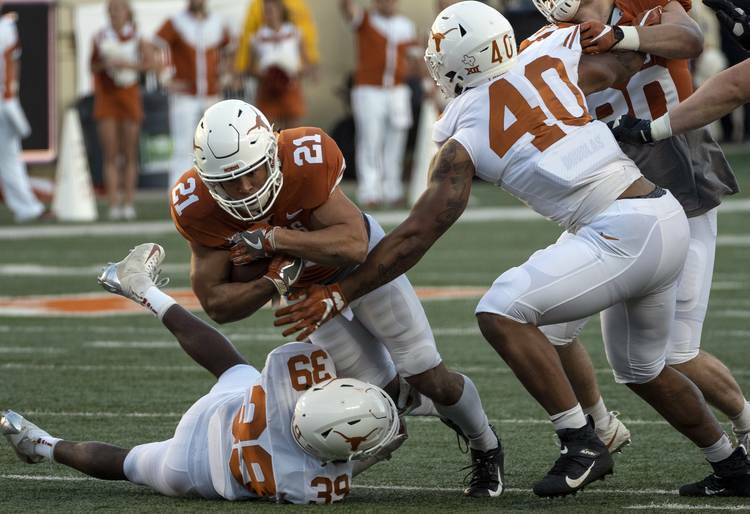 This defense will be OK.
That’s what Texas fans that left Saturday’s Orange-White game are thinking after the close of spring football season. As expected, the more experienced offense got the best of the defense during the spring. That happens when you lose starting linebackers Gary Johnson and Anthony Wheeler, starting cornerbacks Kris Boyd and Davante Davis, nickel back P.J. Locke, top edge rusher Charles Omenihu and Chris Nelson, the team’s most experienced interior lineman. Add to that the absence of starting safeties Brandon Jones and Caden Sterns to injury, and Saturday’s performance provides a few truckloads of hope for the 2019 season. The final score read 12-6 in favor of the White team, whatever that means. The defense, which lost the last couple of scrimmages, had itself a nice night with a near pick-six from Jeffrey McCulloch, another interception from Kobe Boyce and the type of aggressive tackling that was the trademark of last season’s team on most Saturdays. The low score was partly attributed to what turned out to be great kite-flying weather but not the best for throwing the football. The windy conditions took away any chance for a vertical passing game, so Herman and offensive coordinator Tim Beck decided to keep things pretty vanilla offensively. Either way, the cracks of those shoulder pads produced by big hits throughout the night had to be sweet music to the Ludacris-loving ears of Longhorn Nation. Todd Orlando’s defense rolled out an aggressive game plan that made things difficult for Sugar Bowl most outstanding player Sam Ehlinger and his backup, Casey Thompson. McCulloch told reporters earlier this month that the defense was spending more time than it wanted chasing down players like explosive running back Jordan Whittington, so he was more than happy to become the chased after he snuffed out a first-half pass and returned the interception 32 yards to the 1-yard line before being hauled down by Ehlinger just short of paydirt. I’m thinking Sam who would have gotten a thumbs up from millions of fans had he not been in on a tackle in the spring game. McCulloch looked plenty fast as the rover linebacker when he ran step for step with running back Keaontay Ingram on a first-half wheel route. Joseph Ossai also jumped off the screen in pass coverage during similar play against Whittington. The speed stood out as did the hits. Safety DeMarvion Overshown got up close and personal with Thompson on a goal-line collision. Jalen Green showed some nice burst as well with a blowup of Whittington on a pass breakup. Overall it was a real mudder, something the coaches hope to see more of in the fall. Herman has to be encouraged by the step-ups of players like Roach and McCulloch, who are both expected to embrace prominent leadership roles next season. Roach is a senior leader but growing pains will come with the newcomers being inserted into the lineup. Any time part-time players take on more reps, there is an adjustment period. That said, the positive coming from this is that Herman and Co. returned a winning formula to campus after those three lean years under Charlie Strong. Seniors from the Sugar Bowl winner were honored on the Godzillatron during the first half, providing a nice piece of recent nostalgia for the fans while providing a subtle reminder that the bar has been raised. The offense won’t be affected by what was basically a bad practice to end the spring, but the defense can use this performance to further the belief that it can hold up its end come the fall.